Meet upon arrival at Kuching International Airport. 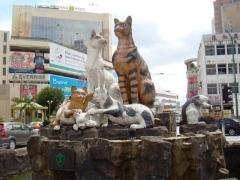 Then, proceed for 3 hours Kuching City Tour. Experience the beauty of multi-racial community and see places of interest & the essential part of Kuching includes the building of the White Rajah, (Colonial Law Court, Clock Tower, Charles Brooke Memorial, Post Office, Square Tower), bustling Chinatown, Chinese Temple. Discover the treasure of Sarawak Museum, Sightseeing to Astana, Malay Village & Kuching Water Front. After tour complete; assist transfer to hotel for check in.